During my childhood days, I am very fond of having sweet buns from the bakery. Whenever me and my sister visit my aunt's home during summer holidays, we used to have bun butter jam almost every evening from a bakery just opposite to my aunt's home. After school days are gone, I didn't happen to eat that. Yeah !! missing those golden days. I never thought to make those at home. Thanks to my college friend Shartaj who has become my recent blog follower, asked for its recipe. 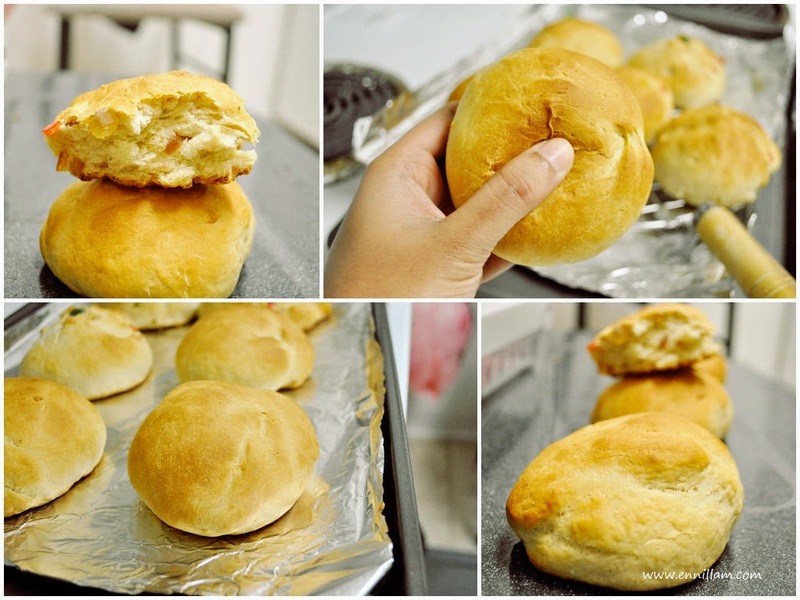 I was so happy hearing a request from her and wanted to make those Eggless sweet buns at home as soon as possible. And I made it. Hurray!! The taste and aroma of this homemade sweet bun is unbelievable and once I done making that, my home is full of that smell. Perfect evening snack for kids after school. Try out this simple sweet buns recipe at your home and share your comments in the comment section below. Enjoy baking !! As I am using rapid rise yeast, I added directly to the flour . If you are using active dry yeast then follow the steps given in the packet to activate the yeast before you add it to the flour. knead it for 10 - 15 minutes. Yes you have to knead atleast 10 minutes to get a soft bun. You can use both your hands to knead well. Once the dough gets doubled, punch it to release the air. Now the dough will be back to its original size. Divide into 6 equal sized balls. I had tutti fruti sitting in my fridge for sometime, so I wanted to incorporate in the buns for a variation. So I divided the dough into half and then mixed 2 tsp of tutti fruti in one half of the dough and made 3 equal balls. I made 3 more equal balls from the remaining dough. If you don't have tutti fruti, no worries. You can make 6 equal balls from the plain dough. place the dough balls with enough spacing . cover it again with cling wrap and set it aside for 40 more mins. After 40 mins, the dough balls size will be doubled. preheat the oven at 350 degree Fahrenheit or 180 degree Celsius for 15 mins. remove the cling wrap and place the baking tray inside the oven and bake it for 20 - 25 minutes until the top crust becomes golden brown in color. Cool it in a wire rack . These buns can be served with butter cream or peanut butter and jam or you can directly have it. Simply delicious and tastes heavenly. Enjoy with hot tea or evening snack.